Live from the Senedd: A hero’s welcome from Geraint Thomas. Geraint Thomas is formally thanked on behalf of the nation on the steps of the Senedd by Llywydd of the National Assembly for Wales, Elin Jones AM, and First Minister of Wales, Carwyn Jones AM. 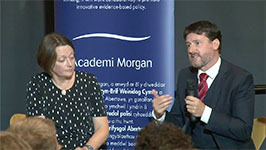 Video courtesy of BBC Cymru Wales. 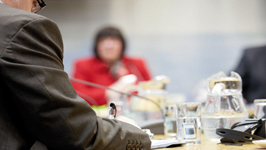 What’s it like keeping a room full of politicians in order every week? 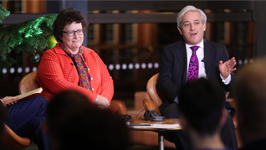 Two people who know are Presiding Officer Elin Jones AM and House of Commons Speaker John Bercow MP. 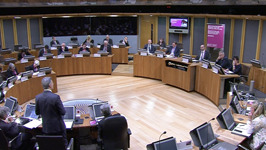 They met at the Senedd in Cardiff Bay to speak to ITV Wales Cymru’s Adrian Masters about their roles, approaches, and how our UK institutions can learn from one another. 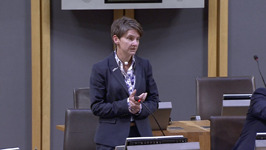 The following video covers the event held at the National Assembly for Wales to mark the 20th anniversary of the massacre of more than 8,000 Bosnian Muslims in Srebrenica. Dame Rosemary Butler AM, Presiding Officer of the National Assembly for Wales welcomed Julia Gillard, former Prime Minister of Australia to the Senedd to talk about her experience as the first female to take this post and any barriers she faced being a female in politics. The Presiding Officer Dame Rosemary Butler AM launches the Women in Democracy Caucus report. Made up of one representative from each of the Assembly’s four political parties, the caucus has been looking at ways to secure a fair representation of women within Welsh democracy. 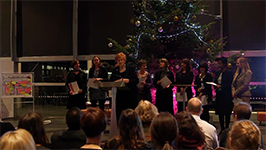 As part of the event Norma Jarboe OBE, launches her latest report ‘A Woman’s Place in Public Appointments’. 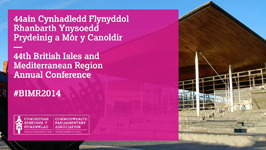 Pupils participate in Senedd Government and Politics Conference 2015 A hundred sixth-form students from across Wales gained first-hand experience of life in the National Assembly for Wales at the annual Government and Politics conference, which took place on 11 and 12 February. 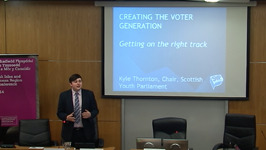 The two-day event featured a series of presentations and workshops designed to educate students on the work of the Assembly and provide an opportunity for them to air their views on issues that are important to them. 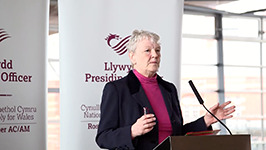 The event was hosted by the Presiding Officer of the National Assembly, Dame Rosemary Butler AM, who has put young people at the heart of the Assembly’s drive to increase engagement with the work of the National Assembly. 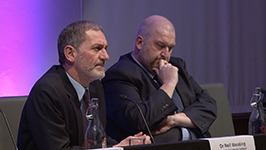 Among the speakers this year were the First Minister for Wales Carwyn Jones AM who answered questions from the students, Professor Richard Wyn Jones who looked at What next after the Scottish Referendum, Desmond Clifford Principal Private Secretary to the First Minister of Wales who looked at the role of the Civil Service; Lleu Williams from Cardiff University Wales Governance centre, Mathew Francis, Public Affairs Assistant, Cardiff University and Chris Warner, Head of Policy and Legislation Committee Service at the National Assembly for Wales. 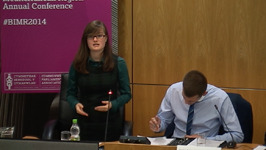 Students took part in workshops to debate the changing constitution of the UK and work with the main four political parties to write manifestos. 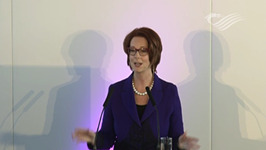 Women in Science: challenges faced by women in science in a globalised world.